If you missed the Eastern Conference Quaterfinals predictions, click here. 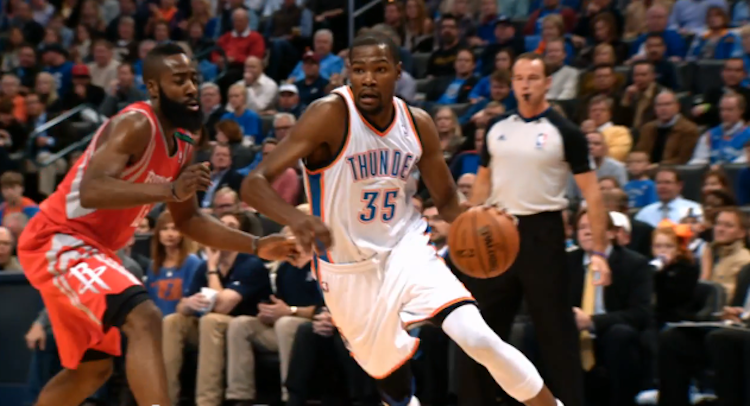 James Harden will try to match Kevin Durant in their first-round series. Yesterday, we looked at the first round series in the East and… yeah, they looked pretty boring. While the Eastern Conference only has two elite teams, the Western Conference goes five deep, which should lead to some better first round basketball… we hope. Any one of these five teams could conceivably make it out of the conference, but once again the odds-on favorite are the Oklahoma City Thunder. Before that discussion happens, let’s look at the first round matchups. Analysis: The Houston Rockets are a young, dynamic team built around the findings of NBA advanced stats. These stats suggest that teams should place a heavy emphasis around 3s, free throws, and shots at the rim, which is Houston’s philosophy in a nut shell. The reason they traded for James Harden, after all, is because his style of play is an advanced metrics dream. Just take a look at his shot chart. While the Rockets can basically score at will, their defensive ratings are lackluster — not a good sign for the playoffs. The Rockets will be facing James Harden’s old team and the odds-on favorite to win the Western Conference, the Oklahoma City Thunder. The Thunder are downright loaded, even without Harden, and rank in the top five in both defensive and offensive efficiency. There’s no one on Houston (or in the entire conference for that matter) that can really check Kevin Durant, who will have a monster series. Prediction: It’s been a fun ride Houston, but this is going to get ugly. Thunder in 5. Analysis: Another regular season, another impressive campaign for the robotic Spurs. The story never seems to change. Even with Tony Parker and Manu Ginóbili missing significant stretches of time most years, they always seem to win more than 50 games. In fact, the last time they won less than 50 games in a season (beside a strike-shortened 1998-1999 season) was all the way back in the 1996-1997 season. There is an ugly side, however, to the Spurs’ incredible consistency. San Antonio hasn’t made the NBA Finals since 2006-2007 and, in the five years since, have bowed out in the first round twice. Oh, the Los Angeles Lakers. Where do we even begin? The Lake Show has had a drama filled season for the ages. The Lakers have suffered countless injuries to all their major players (including losing Kobe Bryant for the season), have fired a head coach, and generally been the NBA’s biggest soap opera. Somehow, however, they find themselves sitting in the seventh spot, playing some of their best basketball of the season. By running the offense through Pau Gasol, who put up a triple-double in his last regular season game, the Lakers appear like a team that could give the Spurs fits. Still, while Gasol and Dwight Howard present matchup problems for the Spurs, the Lakers are extremely vulnerable on the wings (and that was true even before Bryant was hurt). Prediction: The Lakers are going to push the Spurs, but they don’t have enough fire power without Bryant to take the series. Spurs in 6. Can Steph Curry carry the Warriors past Denver? Analysis: The Golden State Warriors were one of the NBA’s nicer surprises this season. After failing to qualify for the playoffs last season, the Warriors bounced back this year, largely in part to an improved defense and an incredible season from Steph Curry. 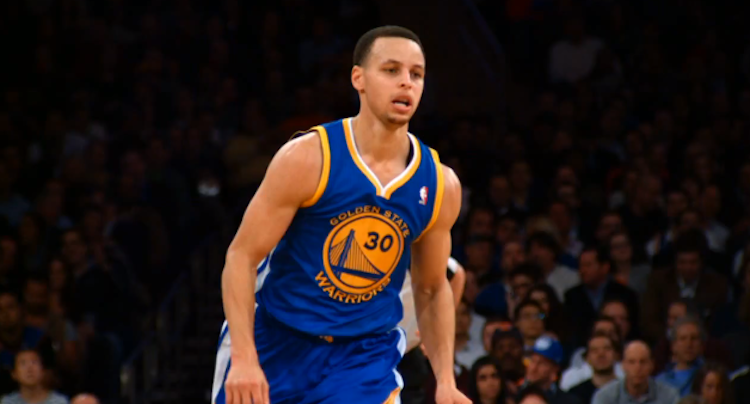 Curry blossomed this season, scoring 22.9 ppg, while shooting 43.2 percent from beyond the arc. If the Warriors are going to make some noise in the postseason, they’ll need Curry to catch fire. Prediction: Denver’s home court advantage will be the deciding factor in an exciting series. Nuggets in 7. Analysis: The Los Angeles Clippers and Memphis Grizzlies are set to meet in the first round for the second year in a row. The Clippers managed to take last season’s meeting in seven games in one of the most exciting series of the entire playoffs. This one is also shaping up to be a classic. The Clippers have improved from last year’s squad, particularly through the addition of Jamal Crawford, a player that can carry them offensively for stretches when Chris Paul is on the bench. However, the Clippers’ defense, their Achilles’ heel from last season, is still very much a concern. Unfortunately, the problem will likely be exacerbated by facing Memphis, a team that is bigger than the Clippers in the frontcourt. The Memphis Grizzlies traded Rudy Gay at the trading deadline, but somewhat surprisingly, have been better without him. I say “somewhat” because like Josh Smith, the stats show that Gay is a rather inefficient player, something the new management in Memphis wants nothing to do with. By taking him out of the lineup, the shots that used to be lost on him have gone to Marc Gasol and Mike Conley, who are both better with their shot selection. Gasol has also led the Grizzlies on the opposite end of the court, with his stellar defense making him a defensive player of the year candidate. Prediction: This series is going to be another classic. Memphis wins in 7 and gets revenge for last season.